A colorful set of calendar plates (including months, days, "tomorrow is", "yesterday was", and "tomorrow will be") in English and Spanish. 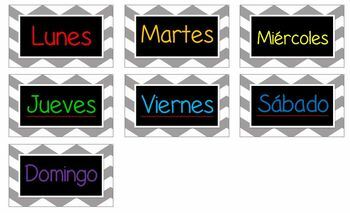 Great for a bilingual or monolingual classroom. Fits standard calendar pocket charts (I use the Scholastic one). All files included are in PDF format.